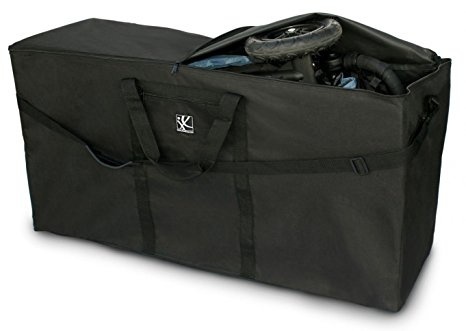 Protect your children's stroller from dirt and damage while on the go with this convenient travel bag. When traveling on vacation or running daily errands in the car, the stroller carrier fully protects the stroller and provides carrying comfort and convenience for you. It's the perfect gear/travel/storage bag for the beach, chairs, high chairs, sports equipment, toys, household items, camping gear, and more. Its zippered side pocket and dual-zippered top opening make it easy to take the stroller in and out of the bag, and the padded hand protector on the carry handle plus the detachable, adjustable shoulder strap with rubber pad make carrying the bag comfortable. Also includes an ID pocket. Made from heavy duty Denier nylon that is water-resistant. Extra large bag measures 42" L x 13" W x 21" H.